For most British folks, it’s just not the holiday season without a classic Yorkshire pudding: an eggy, puffed-up-pancake dish, traditionally served before the main course with gravy and meat drippings. Think of it as a sort of meat donut. I beg to differ. I’m a pretty decent cook, and have successfully made many batches of popovers — a close relation to Yorkshire pudding. And yet my great New Year’s Eve Yorkshire pudding experiment — intended to accompany a roasted leg of lamb — was an unmitigated failure. It came out of the oven completely flat and overly crisp around the edges, having utterly failed to rise. At least it wasn’t soggy to boot. I am not the first to fail at making Yorkshire pudding. Back in 2008, the Royal Society of Chemistry weighed in on the matter, declaring that any bona fide Yorkshire pudding must be four inches tall. (Mine didn’t even come close.) They also issued an “official” recipe, albeit a bit sparse on details: the basic formula is 1/3 cup of flour and 1/3 cup of milk/water mixture per egg used. Honestly, I would have been happy with hillocks instead of the flat, featureless expanse that came out of my oven last night. I was careful with the ingredient proportions. I let the batter rest for 30 minutes to ensure it was at room temperature. I pre-heated the pan (with drippings) before adding the batter. And I followed the cooking instructions to the letter, and never once opened the oven during baking time. So how did it all go so wrong? I’m all about learning from my failures, so I did a bit of online research to find an answer. 1. Was it the recipe? I used this version from Simply Recipes. It has all the requisite ingredients: flour, eggs, milk, roast drippings, a bit of butter, and a dash of salt (I added a pinch of thyme, too). I was careful not to use too much butter, since the drippings already add plenty of fat, and too much fat can inhibit the formation of that all-important gluten network, making for a denser, less puffy texture. Even if it’s not the ideal recipe, per the exacting standards of the RSC, it shouldn’t have failed quite so spectacularly. So I’m inclined to think the problem lies elsewhere. 2. Was it the flour? Many a baker has run aground even with very familiar recipes if they happen to use a low-protein flour by accident. 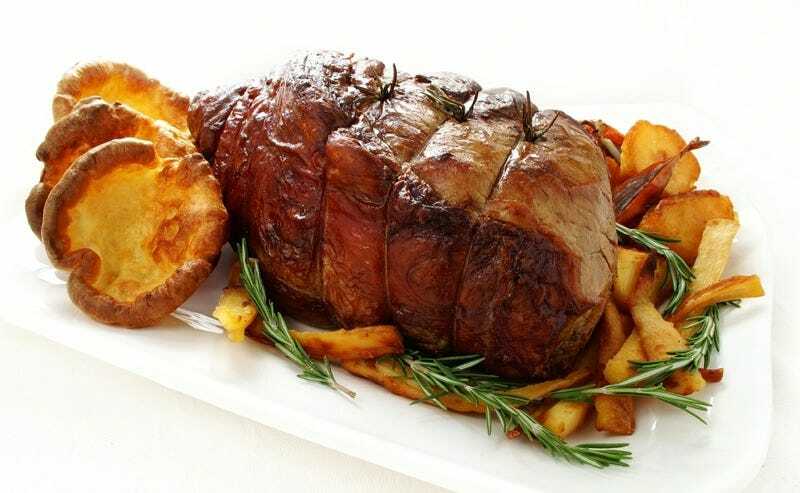 In addition to starch, flour contains two key proteins, glutenin and gliadin, and when you add liquid — milk (sometimes cut with water) and eggs in the case of Yorkshire pudding — they combine into gluten. It’s the gluten network that holds everything together during baking, and less protein hampers that formation. It’s easy to mistakenly use low-protein flour, because labeling of different flours is surprisingly imprecise. But this seems an unlikely explanation for my failure, since (labeling aside) I used the same flour I had just used a month before to make perfectly turned out popovers for dinner guests. 3. Was it the pan? The recipe called for a 9x12 Pyrex dish, and that’s what I used (okay, I used a 9x13, but that’s a minimal discrepancy). Honestly, it seemed too big, although Lopez-Alt insists that one’s choice of pan doesn’t matter. (Yeah, sure, Mr. It’s-Impossible-to-Mess-Up-a-Yorkshire-Pudding.) I could have used my special popover tin to make individual puddings, but I was keen to make the traditional one-dish version as an experiment. Mmmm, Yorkshire pudding in a cast-iron skillet. This seems the most likely source of error. Maybe the pan was too big to support the batter as it tried to rise. And even though I pre-heated the pan, I didn’t heat it for the full 10 minutes advised in the recipe. I’m used to my popover tin, which is an excellent heat conductor and thus heats up very rapidly. Pyrex? Not so much. And if you don’t get that first early burst of high heat, the liquid in the batter doesn’t evaporate fast enough. Without that burst of steam getting trapped by the web of glutens, your popovers won’t pop, and your Yorkshire pudding won’t rise. Conclusion: My failed attempt is likely due to using a glass Pyrex pan and not adapting my technique accordingly to take the difference in heat conduction into account. What do you think? Update: Lopez-Alt has this to say. “That simplyrecipes recipe looks like the proportions are a little wonky. Lots of flour and not much egg. I also wouldn’t trust any recipe for baking that doesn’t list ingredients by weight. Flour can vary by as much as 50% in weight depending on how you pack it into a cup! Use my recipe and use a scale next time.” Will do! New Year’s Resolution: Next year I’ll just use my trusty popover tin and make individual Yorkshire puddings, since clearly I can’t be trusted to do justice to the traditional pan variety. And use Lopez-Alt’s own recipe. We will be eating leg of lamb leftovers for the next two days. Images: (top) Neal Langan/Shutterstock. (middle) J. Kenji Lopez-Alt, The Food Lab/Serious Eats. (bottom) Jennifer Ouellette with trusty iPhone.